Mol. Cells. Mar 31, 2018; 41(3): 234-243. In recent years, the interest towards the relationship between incretins and bone has been increasing. Previous studies have suggested that glucagon-like peptide-1 (GLP-1) and its receptor agonists exert beneficial anabolic influence on skeletal metabolism, such as promoting proliferation and differentiation of osteoblasts via entero-osseous-axis. However, little is known regarding the effects of GLP-1 on osteoblast apoptosis and the underlying mechanisms involved. Thus, in the present study, we investigated the effects of liraglutide, a glucagon-like peptide-1 receptor agonist, on apoptosis of murine MC3T3-E1 osteoblastic cells. We confirmed the presence of GLP-1 receptor (GLP-1R) in MC3T3-E1 cells. Our data demonstrated that liraglutide inhibited the apoptosis of osteoblastic MC3T3-E1 cells induced by serum deprivation, as detected by Annexin V/PI and Hoechst 33258 staining and ELISA assays. Moreover, liraglutide upregulated Bcl-2 expression and downregulated Bax expression and caspase-3 activity at intermediate concentration (100 nM) for maximum effect. Further study suggested that liraglutide stimulated the phosphorylation of AKT and enhanced cAMP level, along with decreased phosphorylation of GSK3β, increased β-catenin phosphorylation at Ser675 site and upregulated nuclear β-catenin content and transcriptional activity. Pretreatment of cells with the PI3K inhibitor LY294002, PKA inhibitor H89, and siRNAs GLP-1R, β-catenin abrogated the liraglutide-induced activation of cAMP, AKT, β-catenin, respectively. In conclusion, these findings illustrate that activation of GLP-1 receptor by liraglutide inhibits the apoptosis of osteoblastic MC3T3-E1 cells induced by serum deprivation through cAMP/PKA/β-catenin and PI3K/Akt/GSK3β signaling pathways. Incretin hormones are secreted from the intestine in response to nutrient intake and potentiate insulin release in a glucose-dependent manner (Creutzfeldt, 1979). Due to the wide distribution of incretin receptors, incretins exert pleiotropic nonglycemic effects on multiple extrapancreatic tissues (Campbell and Drucker, 2013). As the gut-bone axis was identified following the observations from postprandial variation of bone turnover markers (Yavropoulou and Yovos, 2013), the close relationship between incretins and bone remodeling has been extensively studied in the past few years, and considerable evidence indicates that incretins have an anabolic action on bone to serve as potent modulators of bone mass but also of bone quality and ultimate bone strength (Henriksen et al., 2007; Luo et al., 2016; Tsukiyama et al., 2006). Glucagon-like peptide-1 (GLP-1), as a key incretin hormone, is an endogenous 30-amino acid peptide synthesized and secreted from enteroendocrine L cells throughout the small bowel and ascending colon in response to nutrient ingestion (Kim and Egan, 2008). GLP-1 exerts activities mostly via the mediation of GLP-1 receptor (GLP-1R), which belongs to the G-protein coupled receptor family, in multiple tissues such as pancreas, lung, stomach, intestine, kidney, heart, brain and bone (Bullock et al., 1996). When binding to specific GLP-1R, GLP-1 exhibits a diverse set of biological actions including pancreatic effects such as stimulation of insulin secretion and inhibition of glucagon secretion, enhancement of the β-cell mass and sensitivity, and other beneficial extrapancreatic effects on the cardiovascular system, gastrointestinal system, the central nervous system and skeletal system (Cho et al., 2014). However, the bioactivity of native GLP-1 is limited by rapid degradation and inactivation by the enzyme dipeptidyl peptidase IV (DPP-IV) in circulation (Deacon, 2004), which has fostered the development of different kinds of degradation-resistant GLP-1 receptor agonists (GLP-1RAs) as novel class of anti-diabetic medications. Liraglutide, a synthetic fatty acylated GLP-1RA with 97% amino acid homology to native human GLP-1, exhibits a prolonged circulating half-life after a single injection due to noncovalent association with albumin (Juhl et al., 2002). Liraglutide mimics all of the actions of native GLP-1 and effectively ameliorate blood glucose in patients with type 2 diabetes (Madsbad et al., 2004). In addition to their implication in the treatment of diabetes, GLP-1 and GLP-1RAs have been demonstrated to exert favorable effects on bone metabolism, either directly or indirectly on bone cells despite the inconsistency as to the presence of the GLP-1R in bone cells from both experimental animal models and human studies (Gilbert and Pratley, 2015; Papazafiropoulou et al., 2014). However, the mechanism by which GLP-1 exerts its osteogenic effect remains largely unknown. Failing to ascertain the presence of GLP-1R on osteoblasts, initial studies suggested an essential role for endogenous GLP-1 receptor signaling in the control of bone resorption through a potential calcitonin-dependent pathway (Yamada et al., 2008). Following the characterization of functional receptors in MC3T3-E1 cells in spite of some controversy, GLP-1 has been found to interact directly with osteoblasts (Aoyama et al., 2014; Nuche-Berenguer et al., 2010) and up-regulate osteocalcin expression and decrease expression of Runx-2. Although the effect of GLP-1 on osteoblasts has not been fully elucidated, the findings from Pacheco-Pantoja et al. (2011) show that GLP-1 causes significant increases in cell viability in MG-63 at indicated concentrations and that GLP-1R is expressed on osteoblastic precursor cells, but not on mature osteoblasts, suggesting that osteoblast activity regulated by GLP-1 may depend on the osteoblastic differentiation stage. Also, Jeon et al. (2014) described the expression of GLP-1R during osteogenic differentiation of adipose-derived stem cells. Additionally, in human bone marrow stromal cells, GLP-1 was shown to confer cellular proliferation and cytoprotective effects, and to prevent differentiation into adipocytes (Sanz et al., 2010). Recently, it was shown that liraglutide promoted bone formation with increased expression of the runt-related transcription factor 2 (RUNX2), alkaline phosphatase (ALP), osteocalcin (OCN), and collagen α1 (Col-1) in rat and human bone marrow stem cells (Lu et al., 2015). Our previous studies have demonstrated that liraglutide stimulates the proliferation and differentiation of MC3T3-E1 cells via multiple signaling pathways (Wu et al., 2017). However, research regarding the potential effects of GLP-1 on apoptosis of osteoblasts is scant. Therefore, this study was conducted to investigate the effects of liraglutide on the serum deprivation-induced apoptosis of preosteoblastic MC3T3-E1 cells and the underlying molecular mechanisms involved. Antibodies targeting AKT, p-AKT, glycogen synthase kinase 3 beta (GSK-3β), and β-catenin were purchased from Cell Signaling Technology (USA). GLP-1R antibody was purchased from Abgent (USA, Catalog No. AP52040), and β-catenin-Ser675 antibody was purchased from Abcam (USA, Catalog No. ab58615). The AKT inhibitor LY294002 and the PKA inhibitor H89 were purchased from Selleckchem (USA). Mouse osteoblastic MC3T3-E1 cells were purchased from American Type Culture Collection (ATCC CRL-2594) and cultured in alpha minimal essential medium (α-MEM) (GIBCO BRL, USA) supplemented with 10% fetal bovine serum (FBS) (GIBCO BRL, USA) and 1% penicillin–streptomycin at 37°C, 5% CO2 in a humidified incubator. The culture media was changed every 2–3 days. The cells were exposed to various concentrations of liraglutide (0, 10, 100, or 1000 nM) as previously reported (Pereira et al., 2015) to perform the following experiments. The MC3T3-E1 cells cultured in 6-well plates after treatments were fixed and incubated with Hoechst 33258 staining solution (Beyotime Institute of Biotechnology, China) for 30 min. Subsequently, the staining solution was removed and the cells were washed twice with PBS. Finally, images were captured using a fluorescence microscope (IX71; Olympus, Japan). The cells with bright white fluorescent nuclei were considered to be apoptotic cells and those with homogeneous blue fluorescence in the nuclei were considered to be viable cells. 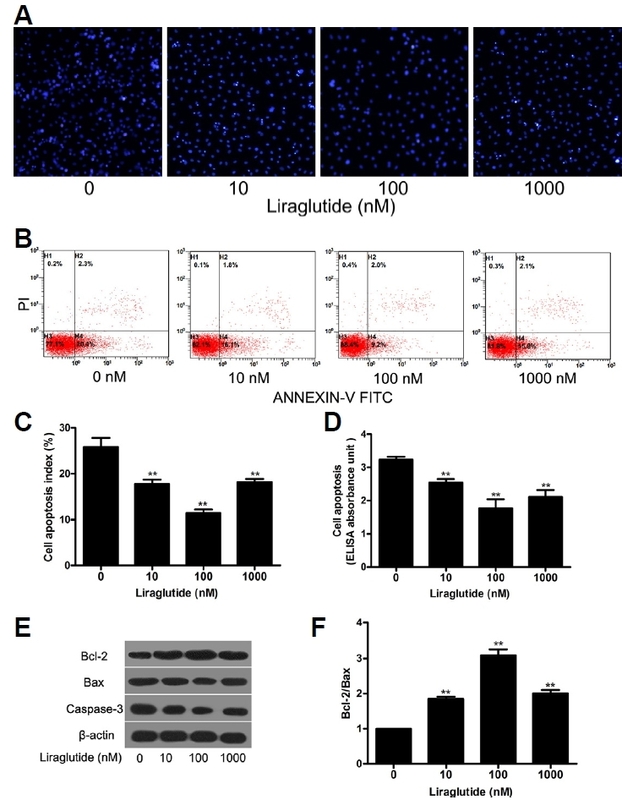 Cell apoptosis was assessed by an Annexin V-FITC/ propidiumiodide (PI) kit (MultiSciences, China). Briefly, the cells were collected and resuspended in annexin binding buffer. After that the cells were incubated with Annexin V-FITC and PI for 5 min at room temperature and analyzed using a flow cytometer (Episc XL; Beckmann Coulter, USA). Cell death detection ELISA plus kit (Roche Molecular Biochemicals, Germany) was used to measure apoptosis according to the manufacturer’s instructions. After cultured in serum-free media for 24 h, cells were exposed to various concentrations of liraglutide for 48 h. Cells were then lysed for 30 min at room temperature and followed by centrifugation at 200 g for 10 min. DNA fragments detected in the supernatants indicated the extent of apoptosis in the sample. Total RNA of cultured MC3T3-E1 cells and mouse pancreas as a positive control was isolated using TRIzol reagent (Invitrogen, USA) and then reverse transcribed using a TIAN-Script RT KIT (TIANGEN, China) according to the recommended protocol. PCR was performed in a volume of 50 μl that included 25 μl of PCR mix (TIANGEN, China) as follows: pre-denaturation at 95°C for 5 min followed by 40 cycles of the three-step PCR (denaturation at 95°C for 45 s, annealing at 55°C for 45 s, and extension at 72°C for 1 min). Then, 5 μl of the amplified products were visualized with ethidiumbromide (EB) after 1% agarose gel electrophoresis. To investigate TCF7L2 mRNA expression, cDNA were amplified using a GoScript™ Reverse Transcription System (Promega, USA) and PCR was performed in a standard 20 μl reaction volume containing 10 μl GoTaq® qPCR Master Mix (Promega, USA) using a BIO-RAD CFX96 touch q-PCR system. Amplification parameters consisted of an initial denaturation for 10 min at 95°C and 40 cycles of two steps (95°C for 15 s, and 60°C for 1min). Total protein was extracted using RIPA lysis buffer with phosphatase inhibitors (Beyotime Biotechnology, China) and protein concentration was determined by the BCA Protein Assay kit (Beyotime Biotechnology, China). Equal amounts of protein were separated by 5% SDS-PAGE and transferred to PVDF membranes using a semidry transfer apparatus (ATTO). The membrane was blocked with 5% non-fat milk in TBST for 1 h at room temperature, and then incubated with specific primary antibodies overnight at 4°C. After subsequent incubation with HRP-labeled secondary antibody (1:3000 dilution) for 90 min at room temperature, the blots were processed using an ECL kit (Santa Cruz Biotechnology), exposed to film, and then detected with Tanon1600 Imaging System (China). To control for immune detection efficiency, GLP-1R protein (AP52040, Abgent, 53 kDa), p-AKT, total AKT, p-β-catenin-Ser675, total β-catenin were diluted 1:1000 with GAPDH as an internal control. Nuclear and cytoplasmic fractions of MC3T3-E1 cells were prepared for detection of the β-catenin protein level using a Nuclear Protein Extraction Kit provided by Solarbio (China). The housekeeping proteins β-actin and Histone 3 were used as internal controls for normalization. For inhibition study, MC3T3-E1 cells were pretreated with the pharmacological PI3K inhibitor LY294002 (20 μM), or the PKA inhibitor H89 (20 μM) 2 h before liraglutide treatment. MC3T3-E1 cells were cultured in 25 cm2 flasks for measurement of cAMP. After treatment, the cell supernatants were obtained after ultrasonication and repeated freezing and thawing. Cytoplasmic cAMP content was measured in lysates using a Cyclic AMP ELISA Assay kit (Nanjing Jiancheng Biotech Institute, China) according to the manufacturer’s instructions. MC3T3-E1 cells were fixed in 4% paraformaldehyde, washed with 0.1% BSA in PBS, permeabilized with 0.3% Triton X-100. After blocking for 1 h, cells were incubated with anti-GLP-1R antibody (1:200) overnight at 4°C, followed by Alexa Fluor®594-conjugated goat anti-rabbit IgGH&L (Molecular Probes, USA) for 1 h. Images were observed under a FV1000 FLUOVIEW confocal laser scanning microscope (Olympus, Japan). Two small interfering RNAs targeting GLP-1R (5′-CCGGACC UUUGAUGACUAUTT-3′, 5′-AUAGUCAUCAAAGGUCCGGTT-3′) and β-catenin (5′-GGGUUCCGAUGAUAUAAAUTT-3′, 5′-AUUUAUAUCAUCGGAACCCTT-3′) and a scrambled siRNA (sense 5′-UUCUCCGAACGUGUCACGUTT-3′, antisense 5′-ACGUGACACGUUCGGAGAATT-3′) were synthesized by GenePharma Biotechnology (Shanghai, China). MC3T3-E1 cells were then transfected with siRNA (50 pmol/well) using EntransterTM-R4000 (Engreen Biosystem Co, Ltd.) following the manufacturer’s instructions. The siRNA silencing efficiency was determined 48 h post transfection by protein analysis for further experiments. Data are expressed as the mean ± standard deviation (SD) and were analyzed using SPSS software, version18.0. All experiments were repeated three times. Statistical analysis was performed using Student’s t-test and one-way ANOVA followed by post hoc methods. P<0.05 was considered statistically significant. To elucidate the functional role of GLP-1 in osteoblast apoptosis, we confirmed that GLP-1R mRNA (399-bp fragment) was expressed in MC3T3-E1 cells using RT-PCR (Fig. 1A). We further validated the expression of GLP-1 receptor protein in MC3T3-E1 cells with Western blot analysis (Fig. 1B) and confocal microscopy (Fig. 1C). 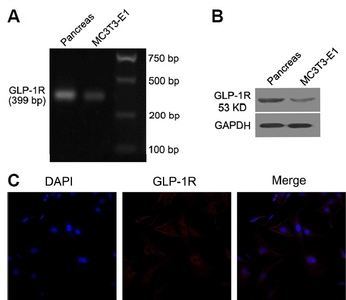 GLP-1R expression in mouse pancreas tissue was used as a positive control. MC3T3-E1 cells were exposed to a range of liraglutide concentrations to determine its effect on apoptosis. After 72 h of starvation, treatment with liraglutide resulted in less apparent nuclear condensation in MC3T3-E1 cells observed by Hoechst 33324 staining as compared to control group, indicating that liraglutide protected cells from apoptosis induced by serum deprivation (Fig. 2A). 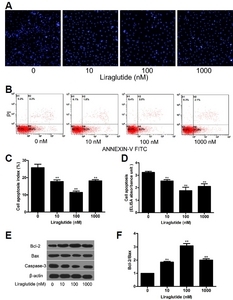 In parallel experiments, the percentage of apoptotic cells from liraglutide-treated group was lower than that from vehicle-treated group, assessed by Annexin V/PI staining and Cell Death ELISA (Figs. 2B–2D). Moreover, the levels of apoptosis-related Bax and caspase-3 protein expression were significantly decreased, but Bcl-2 was significantly increased after liraglutide treatment, as detected by Western blot analysis (Fig. 2E). Correspondingly, the Bcl-2/Bax ratio was also significantly increased (Fig. 2F). Additionally, apoptosis analysis indicated that liraglutide exerted the maximal anti-apoptotic effect at 100 nM of liraglutide, which was selected as the optimal concentration for the following experiments. To investigate the molecular mechanism by which liraglutide exerts its anti-apoptotic effects, the activation of several intracellular signaling pathways was examined. In the present study, our data demonstrated that 100 nM liraglutide induced the phosphorylation of AKT (Figs. 3A and 3B), and elevated the level of intracellular cAMP (Fig. 3F). Meanwhile, the phosphorylation of AKT was blocked by the PI3K inhibitor LY294002. Since the canonical Wnt/β-catenin signaling pathway plays a pivotal role in the modulation of osteoblast apoptosis, we investigated whether it was involved in the effect of liraglutide on MC3T3-E1 cells apoptosis. Our results showed that incubation with liraglutide significantly enhanced the phosphorylation of Ser-675 in the cytosolic β-catenin (Figs. 3D and 3E) and decreased the phosphoglycogen synthase kinase 3β (p-GSK3β) (Ser9) associated with the phosphorylation of AKT (Figs. 3A and 3C). And this was accompanied by increased β-catenin accumulation in the cytoplasm and nucleus (Figs. 3G–3I) along with upregulated TCF7L2 mRNA expression (Fig. 3J). These effects induced by liraglutide were abrogated by the PKA inhibitor H89 and the PI3K inhibitor LY294002, respectively, suggesting that liraglutide activates the cAMP/PKA and PI3K/Akt signaling pathways with β-catenin involved in MC3T3-E1 cells. In addition, suppression of GLP-1R with siRNA blocked intracellular cAMP activity (Fig. 4C), the phosphorylation of AKT (Figs. 4D and 4E) and β-catenin (Figs. 4D and 4F). These results indicate that liraglutide stimulates the cAMP/PKA and PI3K/Akt signal transduction pathways via GLP-1R in MC3T3-E1 cells. To confirm that β-catenin mediated activation of cAMP/PKA and PI3K/AKT signaling pathways via GLP-1R were involved in the regulation of MC3T3-E1 cell apoptosis by liraglutide, we used specific inhibitors and siRNAs to pretreat the cells. Cell death ELISA was performed to determine the apoptosis of MC3T3-E1 cells. Our data revealed that the anti-apoptotic effect of liraglutide exposure was reversed by pretreatment with H89 or LY294002 alone (Fig. 5A). Silencing GLP-1R and β-catenin with siRNA also abolished the anti-apoptotic effect of liraglutide (Fig. 5B), demonstrating that liraglutide prevented apoptosis of MC3T3-E1 cells induced by serum deprivation through the cAMP/PKA and PI3K/Akt signaling pathways via GLP-1R with the involvement of β-catenin. The current study explored the effects of liraglutide on the apoptosis of osteoblastic MC3T3-E1 cells induced by serum deprivation. We confirmed the presence of GLP-1R in MC3T3-E1 cells and our findings supported the protective role that liraglutide exerted on serum deprivation-induced damage in osteoblastic cells. This effect is mediated, at least in part, through activation of cAMP/PKA/β-catenin and PI3K/AKT/GSK3β pathways. Apoptosis is an essential mechanism implicated in all self-renewing tissues to remove poorly functioning and possibly cancerous cells later in life (Kerr et al., 1972). Osteoblasts apoptosis plays an important role in bone development, bone turnover, and repair. Apoptosis can occur throughout the entire life span of osteoblasts, beginning from embryonic limb development and continuing throughout all stages of the working life of this cell. Osteoblast apoptosis, which has been correlated with all major regulators of bone metabolism including bone morphogenetic proteins (BMPs), Wnts, other growth factors and cytokines, integrins, estrogens, androgens, glucocorticoids, PTH and PTH-related protein (PTHrP), immobilization, and the oxidative stress associated with aging, occurs when proapoptotic signals exceed antiapoptotic signals (Jilka et al., 2007). Previous studies have shown that glucose-dependent insulinotropic peptide (GIP) prevents serum deprivation-induced (Berlier et al., 2015) or etoposide-induced (Tsukiyama et al., 2006) apoptosis in human osteoblastic cells. Similarly, another gut hormone ghrelin has been demonstrated to inhibit the apoptosis of osteoblastic MC3T3-E1 cells induced by serum deprivation by activating the GHSR/ERK and GHSR/PI3K/AKT signaling pathways (Liang et al., 2013). Beyond its beneficial effects on glycemic control, GLP-1 has been reported to exert multiple functions in various tissues (Drucker, 2003) on modulation of cell proliferation, differentiation, and apoptosis. Of interest, GLP-1 has been demonstrated as an antiapopotic factor in several cells, such as, pancreatic-cells (Cunha et al., 2009), cardiomyocytes (Ying et al., 2015), and neuronal cells (Kimura et al., 2009). Liraglutide, a long-acting agonist of GLP-1, has been also reported to inhibit apoptosis of various cell types including adipocytes (Challa et al., 2012), and renal tubular epithelial cells (Zhao et al., 2015), in addition to the above mentioned cells. As a GLP-1 agonist, liraglutide exerts its physiological role by binding to GLP-1R, and our results ascertained that GLP-1R was expressed on MC3T3-E1 cells surface, which was in agreement with the findings of Aoyama et al. (2014) and Feng et al. (2016). In our previous study, we have demonstrated that GLP-1R mRNA was expressed in MC3T3-E1 cells with a 111 bp band (Wu et al., 2017). In the present work, we further confirmed this view with a much larger template (399 bp) using RT-PCR. On the contrary, Nuche-Berenguer and colleagues failed to demonstrate the presence of pancreatic GLP-1 receptor in MC3T3-E1 cells. The reasons for the discrepant results in MC3T3-E1 cells are unclear, but an explanation for it may lay in the difference in size and the specificity of the amplification primer (Pallen et al., 1992). Following the confirmation of GLP-1R in osteoblastic MC3T3-E1 cells, the present study demonstrated that liraglutide protects MC3T3-E1 cells against serum deprivation induced apoptosis with the maximum effect achieved at an intermediate concentration (100 nM), not in a dose-dependent manner. One possible reason for this phenomenon is that a minor stimulation of liraglutide did not cause significant anti-apoptotic effect and a higher concentration may display a negative effect. This was because GLP-1 receptors belong to GPCR, they can be subjected to some desensitization or rapid attenuation of receptor sensitivity after exposure to agonists (Ferguson, 2001). However, contrary to the crucial role of liraglutide on the apoptosis of MC3T3-E1 cells, GLP-1 had no protective effect on etoposide-induced apoptosis in Saos-2 cells (Yamada et al., 2008). To our knowledge, Saos-2 cells do not express the GLP-1 receptor, and GLP-1 failed to increase intracellular cAMP levels in this cell line (Yamada et al., 2008), which may account for this discrepancy. Apoptosis may be initiated either by death receptors, members of the TNF receptor family with an intracellular death domain, or Bcl-2 family proteins, which consists of anti-apoptotic proteins (e.g., Bcl-2, Bcl-XL) and proapoptotic proteins (e.g., Bax, Bak), and involves mitochondrial release of cytochrome. Either pathway activates one or more of the initiator caspases (Hock et al., 2001). Although osteoblast apoptosis plays a crucial role during bone formation and fracture healing, it is still unclear which signal transduction pathways are involved in programmed cell death in osteoblasts. Our data indicated that liraglutide upregulated the expression of Bcl-2 and down-regulated the expression of Bax in MC3T3-E1 cells, suggesting the involvement of Bcl-2 family pathway in regulating the apoptosis of MC3T3-E1 cells by liraglutide. Moreover, we found that liraglutide attenuated the activity of caspase-3, which is a critical enzyme for apoptosis and cell survival (Miura et al., 2004). Multiple mechanisms are likely responsible for the antiapoptotic effects of liraglutide in osteoblastic MC3T3-E1 cells. 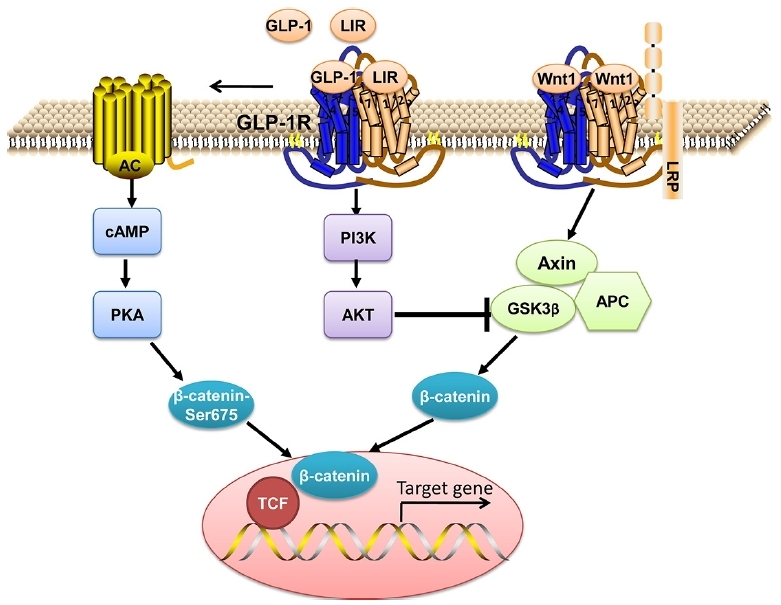 Binding of GLP-1 to GLP-1R can activate several signaling pathways, including cAMP/PKA, mitogen-activated protein kinase (MAPK), phospholipase C, intracellular Ca2+, and phosphatidylinositol 3-kinase (PI3K)/protein kinase B (AKT) (Liu and Habener, 2008). Among them, cAMP/PKA and PI3K/AKT have been reported to interfere with this complex process for osteoblast apoptosis (Chen et al., 2007; Liu et al., 2007). In this study, our data showed that liraglutide can signal through cAMP/PKA with increased cAMP content of MC3T3-E1 cells. Meanwhile, liraglutide can also activate PI3K/Akt signaling cascade. However, the protective effects of liraglutide were not completely mediated through the activation of the two signaling cascades. 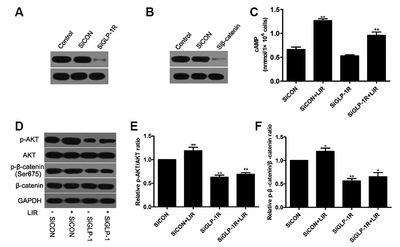 The Wnt signaling pathway plays an important role in cell survival and activation of the canonical Wnt pathway in the osteoblast lineage is associated with decreased apoptosis (Bodine and Komm, 2006). Recent studies have revealed that activation of the cAMP-dependent PKA by the stimulation of GLP-1 via GLP-1R could phosphorylate Ser-675 of β-catenin, stabilising it so that it can enter the nucleus, leading to the nuclear activation of transcription through TCF7L2 (Liu and Habener, 2008). These phenomena were also observed in our experiment for the apoptosis of osteoblastic MC3T3-E1 cells rescued by liraglutide, indicating that activation of the cAMP/PKA pathway could crosstalk with Wnt to gain an anti-apoptotic effect in osteoblasts. Additionally, GSK3β is an important negative modulator of the canonical Wnt/β-catenin signaling pathway (Clevers and Nusse, 2012). In our study, activation of AKT inhibited the phosphorylation of GSK3β then resulting in the activation of β-catenin to promote its nuclear translocation and to increase its capacity for transcriptional activation of TCF7L2 target genes. Together these data indicate that the PI3K/Akt/GSK3β/β-catenin pathways also play a key role in liraglutide-mediated osteoblast survival. Also, the activation of β-catenin and AKT in MC3T3-E1 cells were reversed by pretreatment with the PKA inhibitor H89 and the PI3K inhibitor LY294002, respectively. Furthermore, the activation of cAMP/PKA and PI3K/Akt were blocked by the suppression of GLP-1R with siRNA, which suggests that downstream signaling pathway is mediated through GLP-1R. 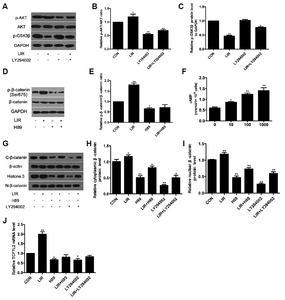 Both inhibition of PKA and AKT and silence of GLP-1R and β-catenin offset the protective effects of liraglutide on serum deprivation-induced MC3T3-E1 cell apoptosis, indicating that liraglutide prevents MC3T3-E1 cell from apoptosis by activating the cAMP/PKA and PI3K/Akt signaling pathways involving β-catenin through GLP-1R. In conclusion, the present study suggested that liraglutide could directly protect MC3T3-E1 cells against serum deprivation-induced apoptosis by activating the cAMP/PKA/β-catenin and PI3K/Akt/GSK3β pathways via GLP-1R. Therefore, liraglutide as a newer antidiabetic agent may confer a beneficial effect in bone metabolism through regulation of osteoblast apoptosis, and may be exploited as a potential therapeutic strategy for osteoporosis, which still requires further clarification. Mol. Cells.Mar 31, 2018; 41(3): 234-243. Received December 2, 2017; Accepted December 29, 2017. Aoyama, E, Watari, I, Podyma-Inoue, KA, Yanagishita, M, and Ono, T (2014). Expression of glucagon-like peptide-1 receptor and glucosedependent insulinotropic polypeptide receptor is regulated by the glucose concentration in mouse osteoblastic MC3T3-E1 cells. Int J Mol Med. 34, 475-482. Berlier, JL, Kharroubi, I, Zhang, J, Dalla Valle, A, Rigutto, S, Mathieu, M, Gangji, V, and Rasschaert, J (2015). Glucosedependent insulinotropic peptide prevents serum deprivation-induced apoptosis in human bone marrow-derived mesenchymal stem cells and osteoblastic cells. Stem Cell Rev. 11, 841-851. Bodine, PV, and Komm, BS (2006). Wnt signaling and osteoblastogenesis. Rev Endocrine Metabol Dis. 7, 33-39. Bullock, BP, Heller, RS, and Habener, JF (1996). Tissue distribution of messenger ribonucleic acid encoding the rat glucagon-like peptide-1 receptor. Endocrinology. 137, 2968-2978. Campbell, JE, and Drucker, DJ (2013). Pharmacology, physiology, and mechanisms of incretin hormone action. Cell Metabol. 17, 819-837. Challa, TD, Beaton, N, Arnold, M, Rudofsky, G, Langhans, W, and Wolfrum, C (2012). Regulation of adipocyte formation by GLP-1/GLP-1R signaling. J Biol Chem. 287, 6421-6430. Chen, X, Song, IH, Dennis, JE, and Greenfield, EM (2007). Endogenous PKI gamma limits the duration of the anti-apoptotic effects of PTH and beta-adrenergic agonists in osteoblasts. J Bone Miner Res. 22, 656-664. Cho, YM, Fujita, Y, and Kieffer, TJ (2014). Glucagon-like peptide-1: glucose homeostasis and beyond. Annu Rev Physiol. 76, 535-559. Clevers, H, and Nusse, R (2012). Wnt/beta-catenin signaling and disease. Cell. 149, 1192-1205. Creutzfeldt, W (1979). The incretin concept today. Diabetologia. 16, 75-85. Cunha, DA, Ladriere, L, Ortis, F, Igoillo-Esteve, M, Gurzov, EN, Lupi, R, Marchetti, P, Eizirik, DL, and Cnop, M (2009). Glucagon-like peptide-1 agonists protect pancreatic beta-cells from lipotoxic endoplasmic reticulum stress through upregulation of BiP and JunB. Diabetes. 58, 2851-2862. Deacon, CF (2004). Circulation and degradation of GIP and GLP-1. Hormone Metabol Res. 36, 761-765. Drucker, DJ (2003). Glucagon-like peptides: regulators of cell proliferation, differentiation, and apoptosis. Mol Endocrinol. 17, 161-171. Feng, Y, Su, L, Zhong, X, Guohong, W, Xiao, H, Li, Y, and Xiu, L (2016). Exendin-4 promotes proliferation and differentiation of MC3T3-E1 osteoblasts by MAPKs activation. J Mol Endocrinol. 56, 189-199. Ferguson, SS (2001). Evolving concepts in G protein-coupled receptor endocytosis: the role in receptor desensitization and signaling. Pharmacol Rev. 53, 1-24. Gilbert, MP, and Pratley, RE (2015). The impact of diabetes and diabetes medications on bone health. Endocrine Rev. 36, 194-213. Henriksen, DB, Alexandersen, P, Hartmann, B, Adrian, CL, Byrjalsen, I, Bone, HG, Holst, JJ, and Christiansen, C (2007). Disassociation of bone resorption and formation by GLP-2: a 14-day study in healthy postmenopausal women. Bone. 40, 723-729. Hock, JM, Krishnan, V, Onyia, JE, Bidwell, JP, Milas, J, and Stanislaus, D (2001). Osteoblast apoptosis and bone turnover. J Bone Miner Res. 16, 975-984. Jeon, YK, Bae, MJ, Kim, JI, Kim, JH, Choi, SJ, Kwon, SK, An, JH, Kim, SS, Kim, BH, and Kim, YK (2014). Expression of glucagon-like peptide 1 receptor during osteogenic differentiation of adipose-derived stem cells. Endocrinol Metabol. 29, 567-573. Jilka, RL, Weinstein, RS, Parfitt, AM, and Manolagas, SC (2007). Quantifying osteoblast and osteocyte apoptosis: challenges and rewards. J Bone Miner Res. 22, 1492-1501. Juhl, CB, Hollingdal, M, Sturis, J, Jakobsen, G, Agerso, H, Veldhuis, J, Porksen, N, and Schmitz, O (2002). Bedtime administration of NN2211, a long-acting GLP-1 derivative, substantially reduces fasting and postprandial glycemia in type 2 diabetes. Diabetes. 51, 424-429. Kerr, JF, Wyllie, AH, and Currie, AR (1972). Apoptosis: a basic biological phenomenon with wide-ranging implications in tissue kinetics. Br J Cancer. 26, 239-257. Kim, W, and Egan, JM (2008). The role of incretins in glucose homeostasis and diabetes treatment. Pharmacol Rev. 60, 470-512. Kimura, R, Okouchi, M, Fujioka, H, Ichiyanagi, A, Ryuge, F, Mizuno, T, Imaeda, K, Okayama, N, Kamiya, Y, and Asai, K (2009). Glucagon-like peptide-1 (GLP-1) protects against methylglyoxal-induced PC12 cell apoptosis through the PI3K/Akt/mTOR/GCLc/redox signaling pathway. Neuroscience. 162, 1212-1219. Liang, QH, Liu, Y, Wu, SS, Cui, RR, Yuan, LQ, and Liao, EY (2013). Ghrelin inhibits the apoptosis of MC3T3-E1 cells through ERK and AKT signaling pathway. Toxicol Appl Pharmacol. 272, 591-597. Liu, Z, and Habener, JF (2008). Glucagon-like peptide-1 activation of TCF7L2-dependent Wnt signaling enhances pancreatic beta cell proliferation. J Biol Chem. 283, 8723-8735. Liu, X, Bruxvoort, KJ, Zylstra, CR, Liu, J, Cichowski, R, Faugere, MC, Bouxsein, ML, Wan, C, Williams, BO, and Clemens, TL (2007). Lifelong accumulation of bone in mice lacking Pten in osteoblasts. Proc Natl Acad Sci USA. 104, 2259-2264. Lu, N, Sun, H, Yu, J, Wang, X, Liu, D, Zhao, L, Sun, L, Zhao, H, Tao, B, and Liu, J (2015). Glucagon-like peptide-1 receptor agonist Liraglutide has anabolic bone effects in ovariectomized rats without diabetes. PloS one. 10, e0132744. Luo, G, Liu, H, and Lu, H (2016). Glucagon-like peptide-1(GLP-1) receptor agonists: potential to reduce fracture risk in diabetic patients?. Br J Clin Pharmacol. 81, 78-88. Madsbad, S, Schmitz, O, Ranstam, J, Jakobsen, G, Matthews, DR, and Group, NNIS (2004). Improved glycemic control with no weight increase in patients with type 2 diabetes after once-daily treatment with the long-acting glucagon-like peptide 1 analog liraglutide (NN2211): a 12-week, double-blind, randomized, controlled trial. Diabetes Care. 27, 1335-1342. Miura, M, Chen, XD, Allen, MR, Bi, Y, Gronthos, S, Seo, BM, Lakhani, S, Flavell, RA, Feng, XH, and Robey, PG (2004). A crucial role of caspase-3 in osteogenic differentiation of bone marrow stromal stem cells. J Clin Invest. 114, 1704-1713. Nuche-Berenguer, B, Portal-Nunez, S, Moreno, P, Gonzalez, N, Acitores, A, Lopez-Herradon, A, Esbrit, P, Valverde, I, and Villanueva-Penacarrillo, ML (2010). Presence of a functional receptor for GLP-1 in osteoblastic cells, independent of the cAMP-linked GLP-1 receptor. J Cell Physiol. 225, 585-592. Pacheco-Pantoja, EL, Ranganath, LR, Gallagher, JA, Wilson, PJ, and Fraser, WD (2011). Receptors and effects of gut hormones in three osteoblastic cell lines. BMC Physiol. 11, 12. Pallen, MJ, Puckey, LH, and Wren, BW (1992). A rapid, simple method for detecting PCR failure. PCR Methods Appl. 2, 91-92. Papazafiropoulou, A, Papanas, N, Pappas, S, and Maltezos, E (2014). Role of endogenous GLP-1 and its agonists in osteopenia and osteoporosis: but we little know until tried. Curr Diabet Rev. 10, 43-47. Pereira, M, Jeyabalan, J, Jorgensen, CS, Hopkinson, M, Al-Jazzar, A, Roux, JP, Chavassieux, P, Orriss, IR, Cleasby, ME, and Chenu, C (2015). Chronic administration of Glucagon-like peptide-1 receptor agonists improves trabecular bone mass and architecture in ovariectomised mice. Bone. 81, 459-467. Sanz, C, Vazquez, P, Blazquez, C, Barrio, PA, Alvarez Mdel, M, and Blazquez, E (2010). Signaling and biological effects of glucagon-like peptide 1 on the differentiation of mesenchymal stem cells from human bone marrow. Am J Physiol Endocrinol Metabol. 298, E634-643. Tsukiyama, K, Yamada, Y, Yamada, C, Harada, N, Kawasaki, Y, Ogura, M, Bessho, K, Li, M, Amizuka, N, and Sato, M (2006). Gastric inhibitory polypeptide as an endogenous factor promoting new bone formation after food ingestion. Mol Endocrinol. 20, 1644-1651. Wu, X, Li, S, Xue, P, and Li, Y (2017). Liraglutide, a glucagon-like peptide-1 receptor agonist, facilitates osteogenic proliferation and differentiation in MC3T3-E1 cells through phosphoinositide 3-kinase (PI3K)/protein kinase B (AKT), extracellular signal-related kinase (ERK)1/2, and cAMP/protein kinase A (PKA) signaling pathways involving beta-catenin. Exp Cell Res. 360, 281-291. Yamada, C, Yamada, Y, Tsukiyama, K, Yamada, K, Udagawa, N, Takahashi, N, Tanaka, K, Drucker, DJ, Seino, Y, and Inagaki, N (2008). The murine glucagon-like peptide-1 receptor is essential for control of bone resorption. Endocrinology. 149, 574-579. Yavropoulou, MP, and Yovos, JG (2013). Incretins and bone: evolving concepts in nutrient-dependent regulation of bone turnover. Hormones. 12, 214-223. Ying, Y, Zhu, H, Liang, Z, Ma, X, and Li, S (2015). GLP1 protects cardiomyocytes from palmitate-induced apoptosis via Akt/GSK3b/b-catenin pathway. J Mol Endocrinol. 55, 245-262. Zhao, X, Liu, G, Shen, H, Gao, B, Li, X, Fu, J, Zhou, J, and Ji, Q (2015). Liraglutide inhibits autophagy and apoptosis induced by high glucose through GLP-1R in renal tubular epithelial cells. Int J Mol Med. 35, 684-692.